Port City of Wilmington, N.C. 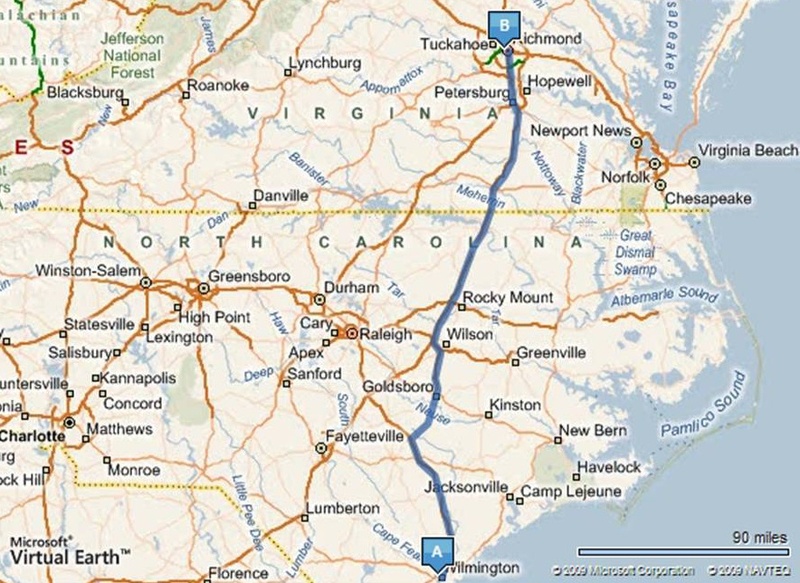 Importance of Wilmington: How important was Wilmington, North Carolina? Wilmington was so vital, it was the critical port that supplied General Lee and his Army of Northern Virginia. It was protected by a string of forts, including Fort Fisher, the South's largest and most formidable fortress. Several attempts were made to isolate and capture both Fort Fisher and Wilmington: from battles, amphibious assaults, the largest naval bombardment of the conflict, and a massive Naval Blockade spanning some 3,000 miles of Southern shoreline. Once the fort fell into Union hands, so went Wilmington, the remaining port of the Confederacy. Lee would now be denied the critical supplies needed to sustain his army in the field. He had referred to the Wilmington and Weldon Railroad as the lifeline of the Confederacy, and when it was captured, the Confederate general would surrender his beleaguered army to Lt. Gen. Grant is merely six weeks. Battle: The Battle of Wilmington was fought February 11 – February 22, 1865, during the American Civil War (1861-1865) and was a direct result of the Union victory at the Second Battle of Fort Fisher. After the fall of Fort Fisher, North Carolina, Wilmington was effectively lost. 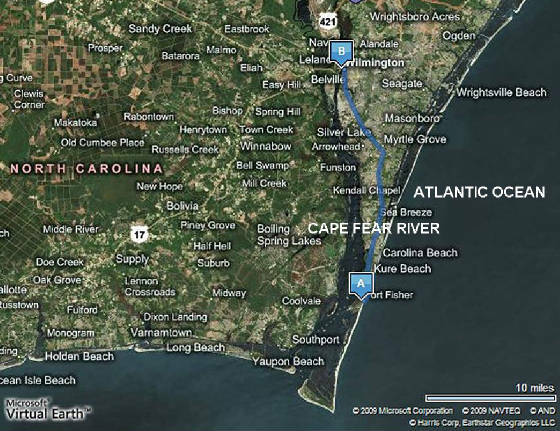 The city was 28 miles up, or north, the Cape Fear River from Fort Fisher and protected by a series of Confederate defenses, known as the Cape Fear River Defense System, along the route. In February 1865, the Union XXIII Corps arrived to reinforce the Fort Fisher Expeditionary Corps, and Maj. Gen. John M. Schofield assumed command of the combined force and moved against the city. The Battle of Wilmington consisted of three smaller engagements along the Cape Fear River. Confederate forces under General Robert Hoke occupied the Sugar Loaf Line north of Fort Fisher. On February 11, Schofield attacked the Sugar Loaf Line with Alfred Terry's corps and drove back the defenders. Next, General Jacob D. Cox's 3rd Division, XXIII Corps was ferried to the west bank of the Cape Fear River to deal with Fort Anderson the main fortress guarding Wilmington. Fort Anderson: Rear Admiral David D. Porter's gunboats sailed up the river and shelled Fort Anderson silencing all 12 guns. Under the direction of Lt. Commander William B. Cushing the Federal Navy constructed a Quaker (or fake) monitor to trick the Rebels into detonating their water mines to make way for Porter's gunboats. Both Cushing and Porter were highly pleased with the success of the ploy, but later Confederate reports claimed the garrison was expecting a dummy boat and were prepared. Meanwhile Cox, supported by General Adelbert Ames' division, advanced up the west bank towards the fort. Cox sent the brigades of Colonel Thomas J. Henderson and Colonel Orlando Moore against the garrison itself while Col. John S. Casement and Col. Oscar Sterhl marched through the swamps around the Confederate flank. Casement and Sterhl encountered Confederate cavalry and pushed it back after a short fight. The fort's commander, General Johnson Hagood sensed the trap received confirmation from Gen. Hoke to pull back to a defensive line along Town Creek to the north. Just as Hagood's troops began their retreat, Henderson's brigade attacked thus taking the fort rather easily along with a few prisoners. Town Creek: Cox pursued Hagood from Fort Anderson, and on February 19 caught up to the Town Creek Line while Terry's remaining troops advanced up the east bank of the river towards the Confederate's Sugar Loaf Line manned by Gen. Hoke's troops. By this time Hoke actually outnumbered Terry as Ames' division was now on the west bank with Cox. Therefore Ames was ferried back across again, but since Fort Anderson had fallen and Porter's fleet was now behind the Sugar Loaf Line, Hoke quickly withdrew to avoid encirclement. Hagood had burned the only bridge across Town Creek to slow down Cox and entrenched on the north side of the river. Cox was eager to attempt his encircling plan that, due to Hagood's retreat at Fort Anderson, the Federals had been unable to complete. So on February 20 Cox's troops found a single flat-bottom boat in the river and used it to ferry three brigades across the creek while the fourth fronted Hagood. The Federals then waded through the swamp and attacked the Confederate flank, routing them, and taking 375 prisoners along with 2 pieces of artillery. The next day Cox rebuilt the destroyed bridge and Schofield's artillery crossed and along with Porter's gunboats both were within range of the city itself. General Bragg saw the hopelessness of the situation and ordered the city abandoned. On February 22 Cox's division marched into the city. (Right) Confederate Soldiers Monument at Oakdale Cemetery, Wilmington, N.C. 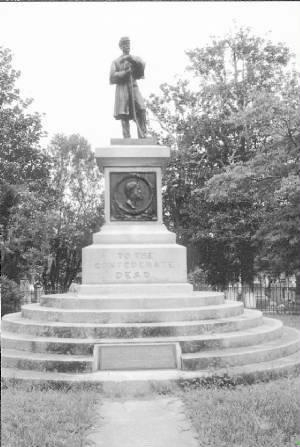 This monument was dedicated on May 10, 1872. Aftermath: The Battle of Wilmington closed the last major port of the Confederate States on the Atlantic coast. Wilmington had served as a major port for blockade-runners, running tobacco, cotton, and other goods to places such as Britain, the Bahamas, and Bermuda. With the port under Federal control, the Union blockade had accomplished its objectives. Bragg next ordered bales of cotton and tobacco burned so that they would not fall into Union hands. Schofield's forces were reorganized into the Army of the Ohio and from Wilmington he marched inland to join with the rest of General William T. Sherman's forces. 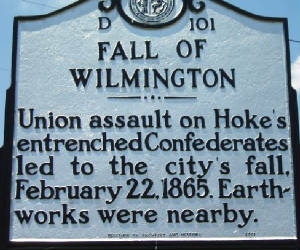 Casualties at Wilmington totaled 1,150. 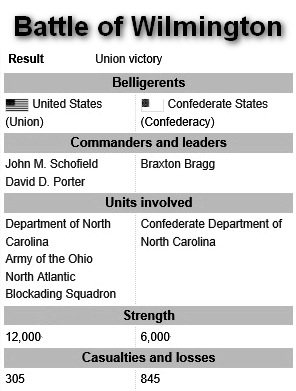 The Union suffered 305 casualties, while confederate casualties were 845. Sources: Kennedy, Frances H., Ed., The Civil War Battlefield Guide, 2nd ed., Houghton Mifflin Co., 1998; National Park Service; Official Records of the Union and Confederate Armies, Series 1, vol 47, Part 1, Page 909; North Carolina Office of Archives and History; Maps courtesy Microsoft Virtual Earth (2D) and (3D).